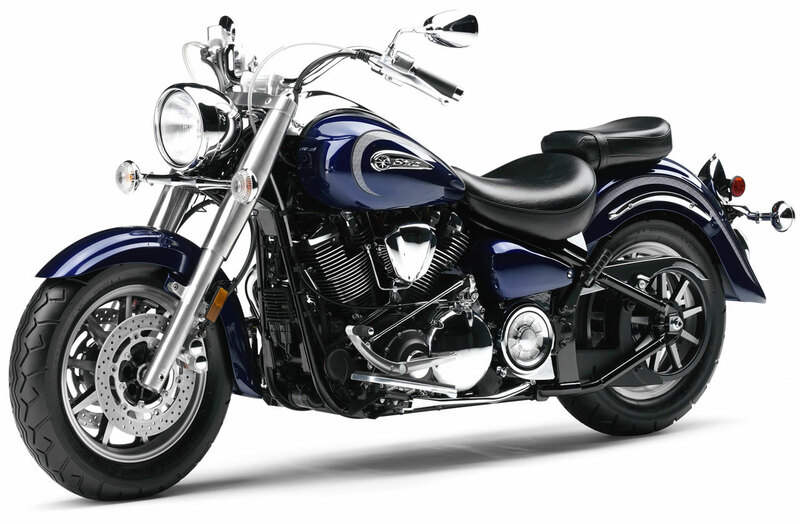 The 2010 Yamaha Road Star is a true classic. With its massive 1670cc air-cooled, pushrod, fuel injected V-Twin and its long, low chassis, it is sure to turn heads as you rumble past. 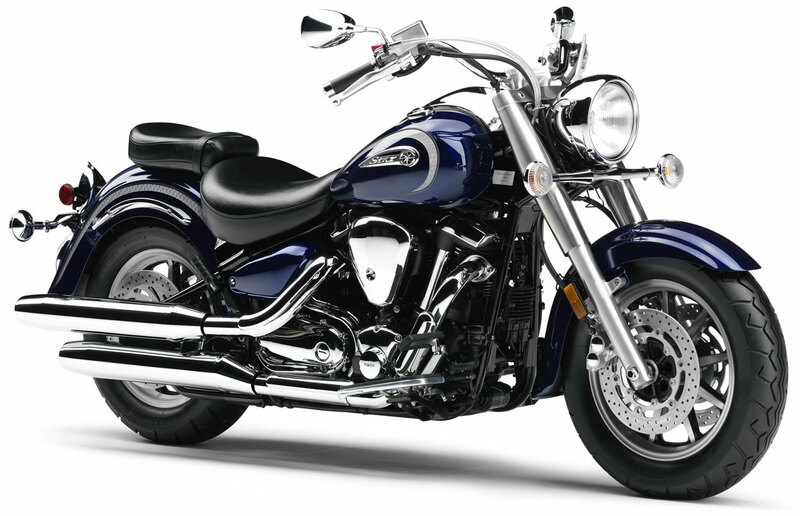 Comfort, performance and style plus Yamaha’s famous quality and reliability. The Road Star sets the standard in big twin performance and style. At the heart of this machine is a massive, air-cooled 1670cc, fuel injected V-Twin that pumps out an awesome amount of piston pounding torque. But “The Roadie” is more than just muscle. Legendary Star styling and attention to detail make it a rolling piece of art that you’ll be proud to ride. ” Hydraulic valve lifters driven by twin crankcase-mounted camshafts deliver exceptional performance and reduce maintenance needs. ” Forged pistons offer great durability and lightweight for fast response. ” Electronic fuel injection with TPS. This system features a single 40mm throttle body with dual injectors (one for each cylinder). The throttle position sensor is linked to the ECU and supplies info about throttle opening so the ECU can adjust ignition timing for optimum engine performance at all rpms. ” Dry sump lubrication system with handy, spin-on oil filter, creates a lower centre of gravity by helping reduce overall engine height. The oil tank is located under the seat. ” Large-flywheel crankshaft delivers superior, low-rpm torque and that incredible V-twin “pulse” feel. ” 2-into-2 exhaust system features beefy, staggered, dual shotgun pipes that produce a soulful V-twin exhaust tune. Muffler replacement is fast and simple, if desired. ” 43mm front forks with large-diameter covers and 140mm (5.5″) of wheel travel smoothes out the ride. ” Spring preload-adjustable, single-shock, rear link suspension lowers centre of gravity for excellent handling and a relaxed, comfortable ride. ” Rear shock is horizontally mounted under the engine and tucked out of sight for that classic, “hardtail look”. Rear wheel travel is 110mm (4.3″). ” Dual 298mm front disc brakes feature R1-inspired, monoblock, 4-piston calipers with chrome “buttons” accenting the outer piston covers. The dual disc brake set-up eliminates the unsettling twisting effect of a single disc set-up found on some cruisers. ” Separate rider and passenger seats provide lots of support and comfort. Passenger seat can be easily removed. ” Nine-spoke, cast aluminium mag style wheels not only reduce weight and maintenance (no spokes to tighten), but they also add a sportier styling image to the Road Star. Since these are mag wheels, they are fitted with tubeless-type, bias ply tires. ” Ultra-thin, tank-mounted speedometer features a stylish design with raised 3D marks to highlight the speed graduations. Instrumentation includes odometer, dual tripmeters, clock and a fuel gauge plus a range of indicator lights. ” Diamond-shaped, LED rear taillight with white lens looks like it is straight off a fully customized machine. The LED design not only provides a bright light, but also uses less power. ” Factory-installed passing lamp relay speeds the installation of the accessory passing lamp kit available through Yamaha Genuine Parts and Accessories. Canadian model will feature spoked wheels.